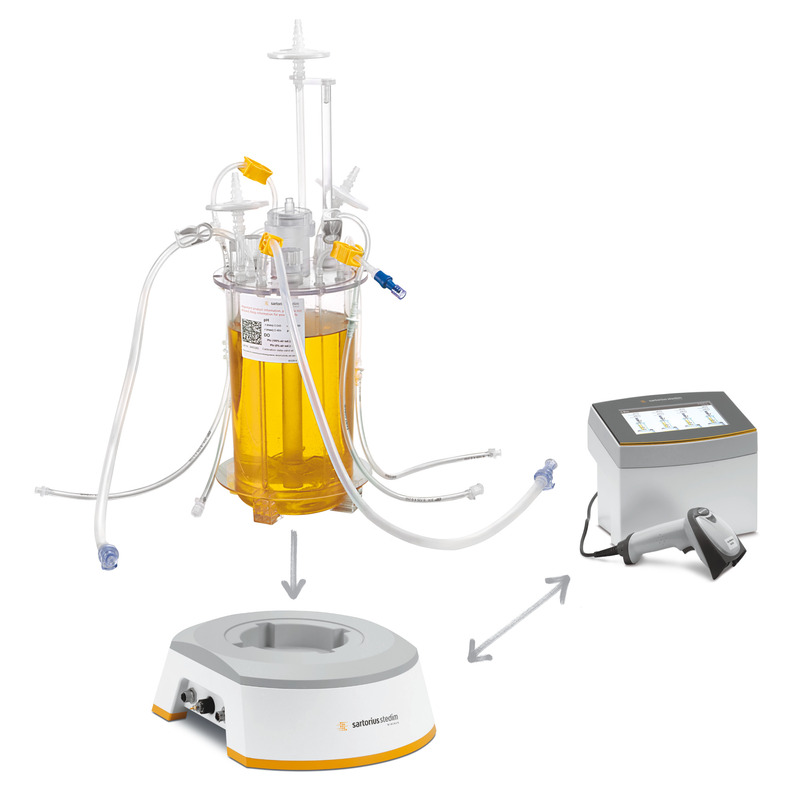 The UniVessel® SU is a stirred tank single-use bioreactor with a working volume range from 0.6 - 2 L. It is entirely single use from vessel to sensor and can easily be connected to your existing bioreactor. It combines the proven, scalable design of glass bioreactors and the fast turnaround of single-use systems. UniVessel® SU can be easily integrated into both new and existing bioreactor controllers in your lab. It can be used interchangeably with glass vessels to help you efficiently manage peak workloads despite challenging timelines. Since you discard the complete vessel after one use, you no longer have to bother with the hassle of cleaning, autoclaving and re-installation. The UniVessel® SU can be used with most bioreactor controllers for glass culture vessels. Stainless steel adaptors for several existing motors are available and can be mounted on the UniVessel® SU stirrer shaft coupling. The motor adaptor features a bayonet lock for secure motor and vessel connection. A bioreactor controller for glass culture vessels may have safety valves integrated that require relatively high pressure to trigger, or even none at all. The UniVessel® SU pressure relief unit features two flowpaths - one for Overlay and one for Sparger – that each have a safety valve to protect the UniVessel® SU from excessive operating pressure. The filter heater is used for heating the exhaust filter to prevent potential blockage. In addition, it holds the exhaust filter in an upright position. The heating | cooling jacket controls the temperature of the UniVessel® SU with a bioreactor controller that has a built-in or external thermocirculator. The jacket can be easily wrapped around the UniVessel® SU and tightly secured by hook and loop connectors for optimal heat transfer. The blanket is used to control the temperature of the UniVessel® SU for bioreactor controllers that have a heating blanket socket. The heating blanket can be easily wrapped around the UniVessel® SU and secured tightly by hook and loop connectors for optimal heat transfer. Effiziente Zellkultivierung: Schneller, flexibler – Einweg!